Except in Ulaanbaatar, there are very few hotels in Mongolia. Touristic yurt camps: the most comfortable. 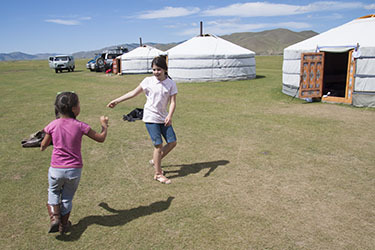 Guest-yurts by nomadic families: the most authentic. Camping: the closest to nature. 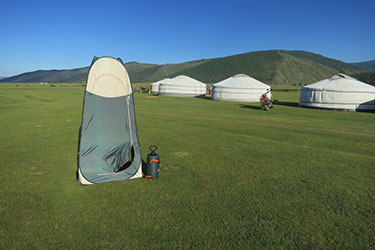 Touristic yurt camps (called gercamps) are the most comfortable accommodation in Mongolian countryside. You sleep in traditional yurts (called gers in Mongolia), furnished with single beds (from 2 to 5 beds / yurt), small tables and a stove. 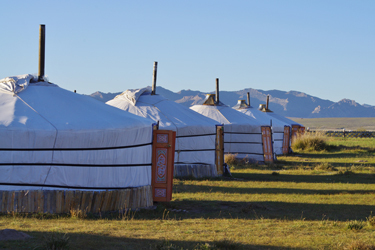 It is very difficult - or impossible - to have single yurts in most of the camps, so be ready to share your yurt with other travellers from the group. Some camps offer yurts with double beds, but it can not be guaranteed. You can find showers, washbasins and toilets in a separate building. A restaurant provides breakfast and meals. Yurt camps are the most comfortable accommodation available in Mongolia, but don't expect luxury: hot water in the showers is often unpredictable, electrical standards are "unique", and food at the restaurants relies on bad supplying conditions due to their remote situation. 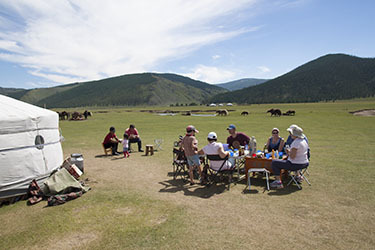 Yurt camps offer simple international food, adapted to their different clients: Mongolian people, and tourists from European, American and other Asian countries (China, Korea, Japan). The comfort of the yurts and furniture depends ont the yurt camps, and we often don't have a large choice of camps in a given place. We always choose the yurt camp offering the best value for money in each place. 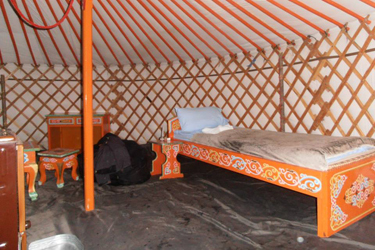 Most of our tours include one night or more in a guest-yurt close to a nomadic family. This accommodation is a unique opportunity to share and discover the traditional way of life of the nomadic herders in Mongolia. 2 or 3 guest-yurts are set close to the the familie's yurt, surrounded by the free roaming horses, yacks, sheep and goats. You will sleep in guest-yurts with 4 or 5 single beds, heated with a traditional stove. Meals are served either in the family's yurt or outside, weather permitting. Your host will prepare traditional Mongolian dishes and it can be interesting to see how women cook only with the central stove of the yurt. For your comfort, a shower tent is provided close to the yurts. Water can be heated on the stove. Dry toilets are also at your disposal. 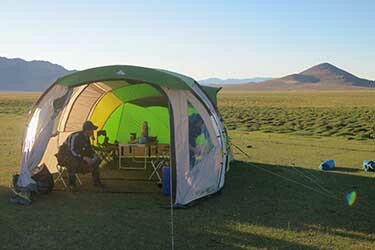 Mongolia is one of the last countries where you can camp wherever you want. Our adventure tours explore the most remote regions of the country and we have selected the best camping equipment to make sure you enjoy the best of this wild environment. 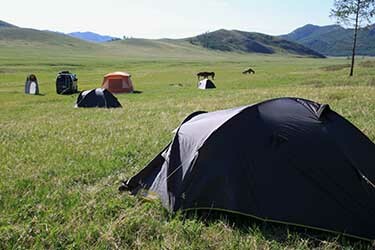 Because the success of your trip in Mongolia is also based on the quality of equipment you use on site, we only use recent camping equipment complying with Western standards of safety and quality for your comfort. All our camping gear and riding is carefully maintained and checked after each trip, and renewed as necessary. We use French Decathlon tents for 1 or 2 persons. For better privacy, we can provide single tents at no extra charge to anyone who registers alone (on request before departure and subject to availability). Our self-inflating mattress are especially thick for your comfort. A large tent hosts table and chairs for meals and moments of conviviality. The logistics vehicle also brings the table and the chairs for the picnic lunch (except in very remote regions, such as Naiman Nuur Park, where we use pack horses). 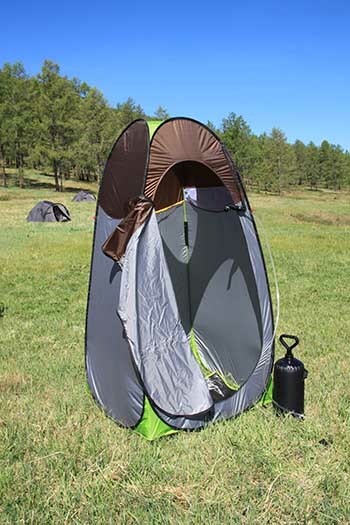 A "shower tent" is also provided. The shower water can be heated on demand on the campfire. This shower tent is also provided on our "Nomadic Life Tours" because you spend several days in nomadic family. Mongolia has a natural environment, but in which circulate many herds, that's why making sure that the water we use for cooking and drinking is safe is essential! 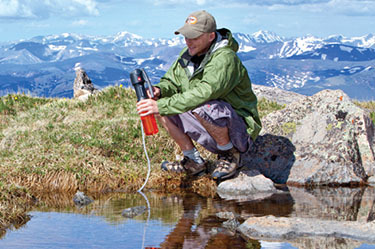 For each trip, we provide a manual filter pump water (Swiss brand Katadyn, the world reference in water purification). 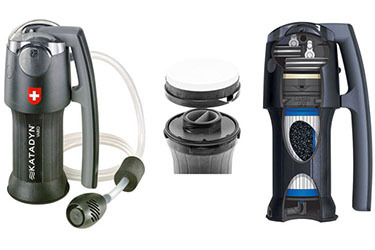 This pump has three levels of filtration : a high performance fiber glass filter, a ceramic prefilter which can be used individually depending on the turbidity of the water and activated carbon to remove odors. In addition to these three levels of filtration, we also use Micropur Forte pills to eliminate viruses and bacteria in 30 minutes.The potability of the water you use and which is used for cooking is guaranteed. Moreover, some of the food is placed under vacuum before departure in order to optimize its conservation during the trip.